Tapas is a wide variety of appetizers or snacks. In Spanish culture, it is designed to encourage conversation. What better time to try serving a tapas than on Valentines Day. Instead of serving Conversation Hearts, serve Conversation Tapas. 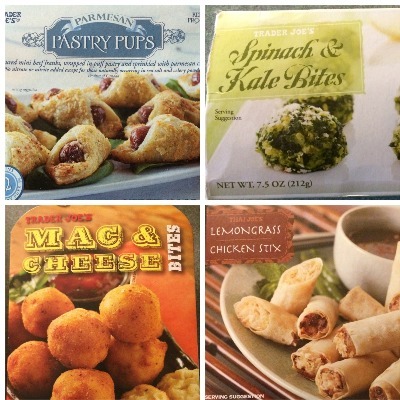 Let frozen appetizers serve as your tapas and help you enjoy the evening (I like to pick mine up from Trader Joe's). Or reheat some of my Meatball Meals. You can get a wide variety of tastes in easy bite sized portions. Its fun, fancy and takes little time to prepare. Let's be real, Valentine's Day is All About the Dessert! 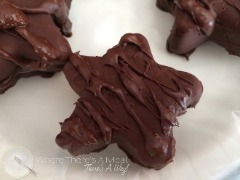 For chocolate lovers try my Dark Chocolate Covered Banana and Almond Butter Stars, but instead of using a star mold, go get a heart silicone baking mold. 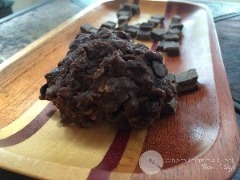 Did I mention these are paleo, vegan and gluten-free? What's not to love? Here's another guilt-free indulgence. ​Sweet Debbie's Oatmeal Fudge Chocolate Chip Cookies. They're a great addition to any dessert menu, plus they are vegan. Who says desserts can't be healthy? 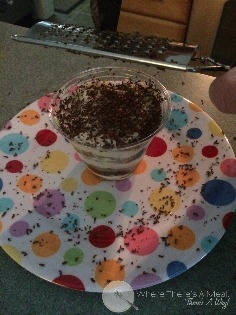 My version of Tiramisu, which I like to call Tira"ME"sue, combines coffee and dark chocolate to create a decadent dessert. I like to make them in individual sizes so you have a pre-portioned, easy to serve dessert. Want to Spend Valentine's Day with me? No matter who your with, what Valentine's Day would be complete without a romantic movie? I suggest Safe Haven. Look at that girl getting off the bus behind Julianne Hough. Yep, thats me! Nicholas Sparks' new movie, The Longest Ride, is coming out this spring, and I just might pop up in that one as well. If you're looking to avoid the crowds this Valentine's Day, stay in because, where there's a meal, there's a way!